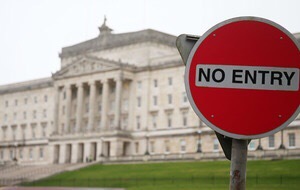 #Brexit and a suspension of NI institutions – a Heisenberg Uncertainty sized crisis? Here is a worrying thought with which to start your week: in two years’ time, we will look back at these last few weeks with fondness and regard them as the last period of stability and calm before the storm. Not a nice prospect, huh? Yet it is entirely possible that two separate but related and linked events due occur over the next month could throw us into several years of instability and confusion. The first, and more obvious, of the two events is the triggering of the Article 50 Brexit clause by the British Government. This may happen at the March 9th EU Summit in Malta, though the UK’s Brexit Minister recently hinted that they may wait until later in the month, either way it is certain to happen before the end of March. We already know how costly and disruptive this will be for us here. But a second event, due to happen later this week, could potentially make what would have already been a difficult situation considerably worse. That second event is next Thursday’s Northern Ireland Assembly election. Most commentators and pundits believe that the result after the election will broadly be in line with the one before it. The issue at stake at this Thursday’s Assembly election is not who gets what number of seats but rather whether the Assembly voted in next Thursday has the political will to elect a First and Deputy First Minister and return to operation. The issue is even more clear cut than that. Will the DUP and Sinn Féin have the political will and backbone to take the result and make it work or will they both continue to play the vapid and empty orange and green politics that we have seen them engage in for the past few weeks and months. While each side will point the finger at each other in the classic Northern political game of whataboutery – they are equally responsible. Arlene Foster’s partisan intransigence is matched by Sinn Féin’s opportunist disruptive-ism. Our two parties are now in an Executive facing in the same direction. We made promises to voters that we will keep – taking on the heavy responsibilities that come with elected office, governing in their best interests, tackling head-on the tough decisions. Others decided to duck the challenges and retreat to the Opposition benches. That is a matter for them…. We are in this for the long haul. That was on November 21st last – the long haul is not as long as it used to be, especially when there are political points to score. Their delight and bonhomie may also explained, in part, by the ease with which they had happily carved everyone else out of the picture a year earlier in the ill-named Stormont Fresh Start deal. Right now, we are looking at a suspension of the key institutions established under the Good Friday Agreement: The Assembly and the Executive for a period of perhaps six months, or even a year. So, we enter a major negotiation on our neighbouring island (sometimes known as Great Britain) exiting the EU at a time when Northern Ireland – whose status and future in those negotiations is a key interest and concern for us – is set to enter a period of political instability. Not that you would know this from listening to anything coming out from either Dublin or London. Rarely have the two sovereign governments been less prepared and less well equipped to handle, never mind resolve, a crisis in Northern Ireland. Here in Dublin, the political side of the government machinery is more focused on its internal machinations and the leadership of Fine Gael. Neither of the two main contenders for the Fine Gael leadership have ever exhibited much interest in the North or the Good Friday Agreement, though on this score FG is consistent as our current Foreign Minister, Charlie Flanagan, is more disinterested in the North than most. While the political side of government is in a state of bewilderment, the institutional side is at least watching what is going on, though it is tough to do this while straining to find the resources to deal with one of the most complex negotiations we have ever conducted with the EU. Meanwhile, across the sea Theresa May’s government is focused, nay fixated, on the Brexit negotiations and finding a way not to (a). bankrupt their economy by cutting it off from its biggest market and (b). end the Union by disregarding the clearly stated will of the people in Scotland, Northern Ireland and central London. Coupled with this Prime Minister May has landed Northern Ireland with a Secretary of State who is disinterested in dealing even-handedly with the parties there or even following events in Northern Ireland. This does not augur well. The problem is not merely that the Irish government is going to have deal with two major simultaneous political crises – Brexit and suspension of the institutions in the North – but that the discussions in Brussels and the issues in Belfast are considerably intertwined and each exert pressures on, and creates stresses under, the other. Add to this the potential for even greater destabilisation within the United Kingdom as the Scottish government increasingly moves towards a second independence referendum and you have a mix for a highly volatile and difficult situation not just within Northern Ireland but across this and the neighbouring island. One of the great strengths of the Good Friday Agreement as negotiated by Bertie Ahern and Tony Blair is that it recognised that the tree strand nature of relationships on these islands. The first strand was the internal relationship between the two communities in the Six Counties. The second was the North/South relationships between the North and the remaining 26 counties of the Republic. The third is the east-west strand between the British and Irish Governments. One of its weaknesses is that it set these in the context of our mutual membership of the EU, but did not explicitly recognise this underpinning fact anywhere in the text. So, there you have it. We are about to face into political problems whose complexity and duality are of Heisenberg Uncertainty Principle dimensions and all we have to tackle them is a choice between are two primary school science teachers. Worrying… isn’t it? Do @realdonaldtrump supporters fear this is last chance to elect a white guy as @POTUS? When Hillary Clinton told a cheering audience that she thought half of Donald Trump’s supporters were “deplorables” she gave the Donald Trump campaign a stick with which to beat her. And boy have they wielded that stick. Their strategy was clear. Use her careless comment both to energise the existing core Trump support base and to try to expand it. While they may have succeeded in the former aim, they are struggling, if not plainly failing, when it comes to the latter. Nonetheless, it is a valid strategy as her comment, with its apparent dismissal of up to 20% of the American population, only served to confirm the image of Hillary Clinton as the ultimate out of touch insider, a part of the Washington political elite. The strategy also assists Trump to portray himself as the bold and brash “outsider, the champion of a middle America that feels their country has lost its way and is now failing to deliver the American Dream for them and – more critically – for their children. The strategy sits neatly with Trump’s campaign blueprint: present Donald Trump as a willing battering ram which disillusioned voters can use to attack and demolish a broken and unresponsive political system, be it Republican or Democrat. Trump’s core voters are using him everything bit as much as he is using them. Take out the word “half”, the specific word for which she has since apologised several times, and put the stress on “grossly generalistic” and it is hard to deny that some of his supporters fall into those categories. Are these the defining characteristics of his candidacy? No. Has he used some of these dog whistles to exercise certain blocs of voters? Yes, though he would not be the first to do so. While Trump is undoubtedly playing on people’s fears and concerns, those fears and concerns existed before Trump appeared on the political field. He is merely riding a Zeitgeist which he did not create but which others have ignored. As Prof Simon Schama tweeted in the midst of the anger and turmoil following the horrific Orlando shooting: “…we have a cultural civil war now in USA”. That cultural civil war is being played out in this election with many of those planning to vote for Trump fighting what they believe is a last ditch battle for an America they can recognise and feel a part of, but which they fear is disappearing. Since the 1970s the American middle class has shrunk from 61% of the population to 50%, and the American dream has become an increasingly distant prospect for the majority. There is a smack of the “stop the world, I want to get off” to their concerns, be it globalisation, changing world of work, growing diversity, changing lifestyles. Race plays a part too. Might there also be a cohort within Trump’s core base who feel (or is it fear) that the changing American demographics means that this is their absolutely last chance to elect someone just like them: old, white and male? His stubbornly high support levels among older white males, especially those with no third level education suggest that this was the first group to embrace him and may be the last group to abandon him. Might this cohort, who once felt they were the typical average American and were at the core of American society, now feel so alienated that they are willing to forgive Trump any indiscretion in the hope that his election will help them return to the old certainties? I suspect the answer was: yes, they were, but that they will now gradually start to abandon him as they realise that his flaws and weaknesses are so intrinsic and deep seated that he useless as a battering ram and has no hope of changing anything. Trump’s defeat will not end the cultural civil war. Neither will Clinton’s election, unless she realises that while the “deplorables” are an irredeemable tiny minority, that the zeitgeist described above needs to be acknowledged. This is one of my Broadsheet opinion pieces from back in July 2017. In it I set out why Dublin does not need a Boris Johnson or Ken Livingstone. What is it about bad political ideas? When it comes to tenacity and resilience they put the cockroach to shame. While the cockroach simply trundles along looking loathsome and malodorous, bad ideas manage to get worse over time and yet somehow develop an enticing perfume. So it is with the idea that Dublin should have a directly elected Mayor. Once again this superficially alluring proposal is being promulgated by some, including – though not exclusively – the Green Party. 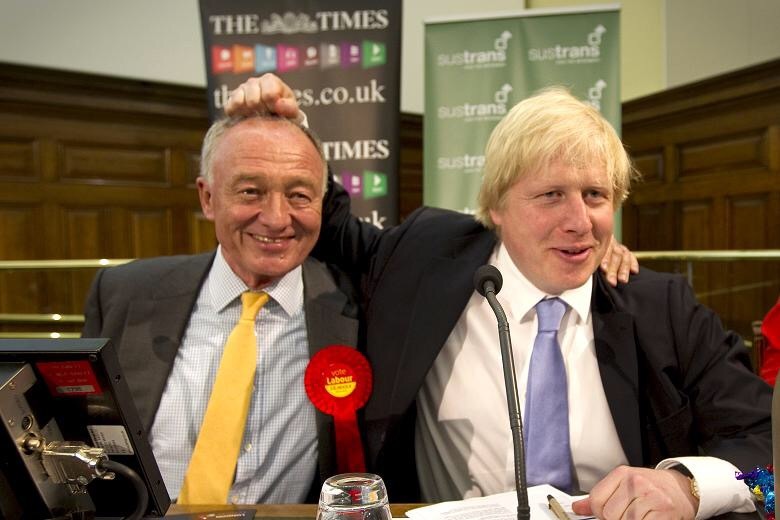 It is as if its proponents had looked across the Irish sea, seen the absolute mayhem that the first two elected Mayors of London: Ken Livingstone and Boris Johnson, have wrought on the political scene so far this year and thought: hmm, how could we get some of that here. It is not as if this is a new idea either. It has been trotted out in a couple of incarnations over the past decade and a half. 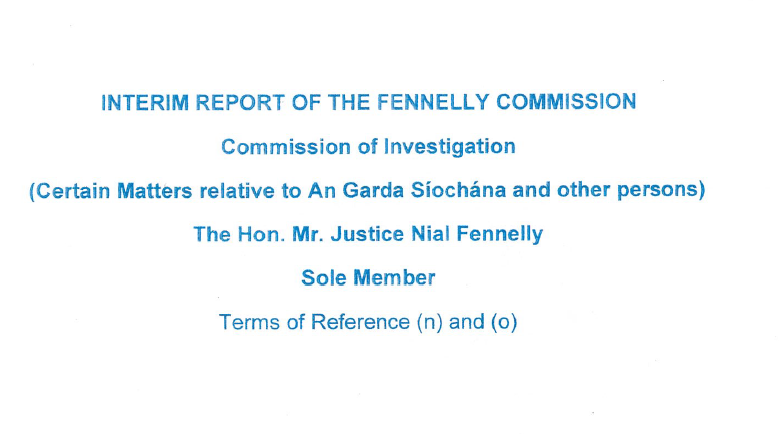 Today the Government published the Fennelly Commission report in a PDF format on the http://www.merrionstreet.ie and http://www.taoiseach.ie, though there have been huge delays in accessing the file. 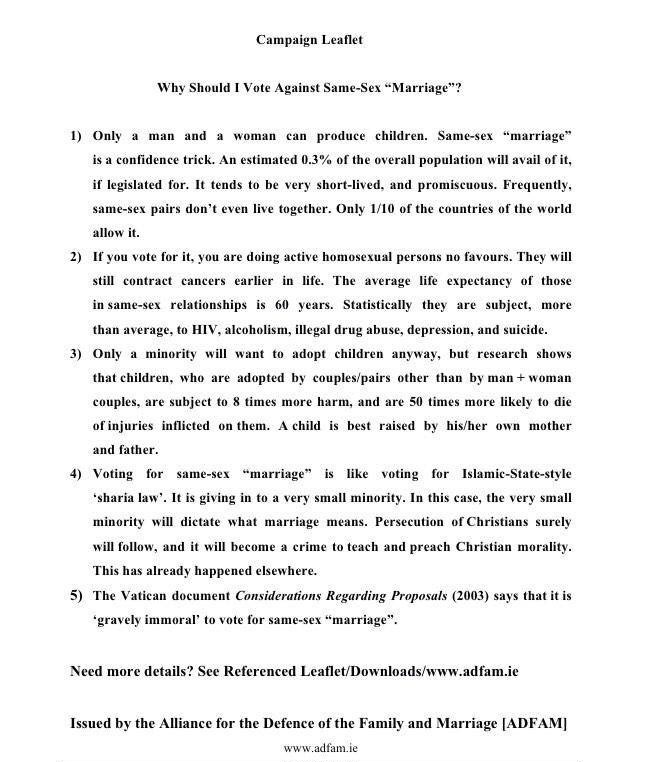 Was the #MarRef No campaign just a bad Karl Rove tribute act? Earlier today I posted my thoughts on the Marriage Equality referendum and highlighted some of the key campaign components of the Yes Equality campaign which I believe helped it secure a historic overwhelmingly victory. In this piece I will do the same with the No campaign though this time I do it from outside, rather than inside the campaign. Last November the Yes Equality group invited me to make a presentation to their core campaign team on the lessons learned working with the No side during the Seanad Abolition campaign. In other words voters will instinctively tend to vote No UNLESS they are convinced of the need for and benefits of the proposed change, especially where they had no deeply considered view on the issue in the first place. The other slide, which I showed first, was more optimistic. It drew on research from Dr Jane Suiter and Dr Theresa Reidy showing that there is very little movement away from the Yes side where the issue is one that accords with the voters’ core fundamental values and attitudes. Perhaps the biggest single error the No campaign made was that it did not develop a new campaign playbook. Instead it re-ran the old one from the Ireland of the 1980s and 1990s, failing to recognise that the public mind-set had moved on. While the YES side was about discussions and empowering, the No sought to ordain. Its commentaries and messaging had all the hallmarks of sermons and and more closely resembled was being told what to do and think than campaigning. This is not to say that they stuck with the campaign tactics of the era, far from it. The No side saw the power of social media and did seek to use the platforms – the problem was that they went to quantity over quality and presumed that the bulk messaging that may work in the USA doesn’t play here. No side gambled on a low turnout? While the No side clearly understood the point about voters being resistant to constitutional change, they made the mistake of thinking that was all there was to it. The no side mistake seemed to think that all they had to do was raise awkward questions and bring in extraneous matters and the win was in the bag. The No side rarely seemed to stray beyond that simple flawed strategy. It had a definitive tactical advantage from the outset, but rather than capitalising on that – it relied on it. From the outside it looks like they gambled on a low turn-out and their capacity to mobilise their forces and get their big wedge of core voters out to vote on the day. This was a big mistake as their messaging and postering campaigns were so shrill and pointed that they only served to incense the middle ground (esp single parent families) and drove up turnout on the other side. Perhaps as a consequence of this gamble on a lower turnout, the No side also seemed to run a messaging campaign that was primarily aimed at voters it already had in the bag and never reached much beyond the boundaries of its own minority. 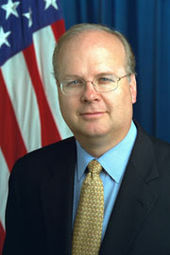 Was this an Iona reworking of 2004 Karl Rove (pictured) base strategy: do not put so much effort into convincing traditional swing voters in the middle, but instead look to the disaffected voters on your (right) fringe and mobilise them to come out in bigger number? The logic of this approach in the American context is that you get a bigger bang for your buck. The competition for the people on your outer fringe is obviously less than it is for those in play in the middle. These people feel disaffected – your role is to excite and mobilise them and get them voting in bigger numbers. 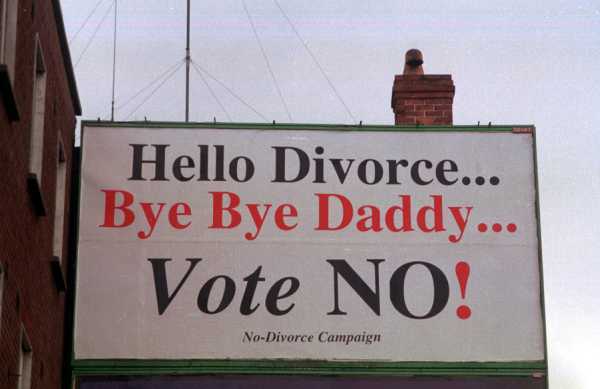 Though it tried to label itself as the underdog it statistically was the No campaign still looked and sounded like a Dublin based middle class elite speaking to us from the late 1980s. The absence of a genuine popular ground campaign compounded this impression. This perhaps helps to explain the high turnouts and higher yes votes in working class areas. 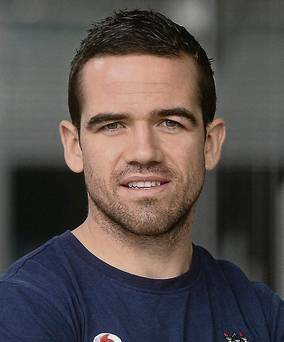 It also failed to produce many unexpected No voices – its only real effort in that regard, producing Ger Brennan (pictured) was a good one despite Ger’s admittedly faltering Morning Ireland interview. He came across as sincere and genuine, qualities that non committed /soft yes voters did not associate with other no voices. The No campaign possibly thought it had a trump card in the unexpected voices game with its two articulate gay voices – but it was a card they way over played. They failed to see that continually parading these two voices only served to give the impression that they were the only gay people they could produce on their side. Not only that they were male, middle class 40+ (being kind here) and the products of an Irish society that had treated them unkindly – a society and attitude the Yes side were more credible as seeking to banish to history. Possibly one of the No sides biggest strategic errors was it’s playing of the victim-hood card. It is not that it was wrong to try to play it, but rather that it played it so unconvincingly. It is hard to claim to be the David to the other sides Goliath when their Goliath looks young, friendly and speaks quietly. The No side bleating that it was being attacked by the Yes campaign had diminished credibility when viewed alongside the scurrilous things its activists were saying on posters and leaflets (example below). Perhaps this was another example of an American campaign tactic being transferred across the Atlantic and used badly – once again the trick comes from the Karl Rove playbook, in this case it involves projecting your side’s weaknesses on to your opponents. The No side protests about Yes sided campaign financing is an excellent case in point. The No campaign frequently proclaimed its own penury – but that’s a hard case to make when you are spending (at least) over half million euros (see my blog) on postering alone and the evidence is there for all to see. It is also unwise to claim your YouTube clips have been viewed 680,000 times when those are paid pre-roll ads (i.e. the clips you are forced to watch for 5 – 10 secs before the YouTube video you wished to watch is played). These pre-roll ads are not cheap – so it is not wise to give the other side a figure to use when calculating what you spent. Another element of this victim-hood, which the No side continues to play even after the campaign, is its cry that it had no political parties on its side. Clearly this is true, but this fact should have been a fore warning of the degree to which it was on the wrong side of the issue, not a cause for complaint. Its ongoing complaint that no political party now speaks for the 730,000 plus voters who voted no misses a number of important points: including the fact that the no cohort is no more a homogeneous grouping than the Yes side and that voters are more motivated by bread and butter issues in general elections than they are by social ones. These are early thoughts only. They are some crude (and at times rambling) musings penned on the morning after the night before, but it is based on reviewing some notes put together back in late February for the Yes Equality campaign. Though this list is by no means exhaustive, here are four key elements which I see as essential to the success of the Yes Equality ground and air campaigns. My analysis, though that is an over glorified to describe this, is confined to the campaign tactics and machinery. I am primarily looking at this as a campaign, but that is not to dismiss the importance of the arguments and the justice of the cause. This, I believe, was the key campaign narrative. The campaign was underpinned by the belief that Irish people are fair minded. Ireland and her people are welcoming and confident. This vote was simply about making the laws reflect that reality. By voting yes people were just voting to give gay people what everyone one else already had – to do otherwise would be fundamentally unfair. This was at the core of message powerfully delivered by former President Mary McAleese, former Minister Pat Carey and former Commissioner Marie Geoghegan-Quinn. Is #marref no campaign only spending €200k? Here is a simple calculation that explodes this myth. From many years of experience of running election campaigns I know that in a 4 seat Dáil constituency you need to have at least 1,000 lamp post posters to have a decent and noticeable presence during an election campaign. Based on my observations in the two Dublin constituencies I would know best (Dublin South Central and Dublin South East) the combined No campaigns have put up at least that number. Indeed, the high visibility of their posters (and they have done at least two poster runs so far) suggests that they have put up anywhere between 1,200 and 1,500 posters in each constituency. 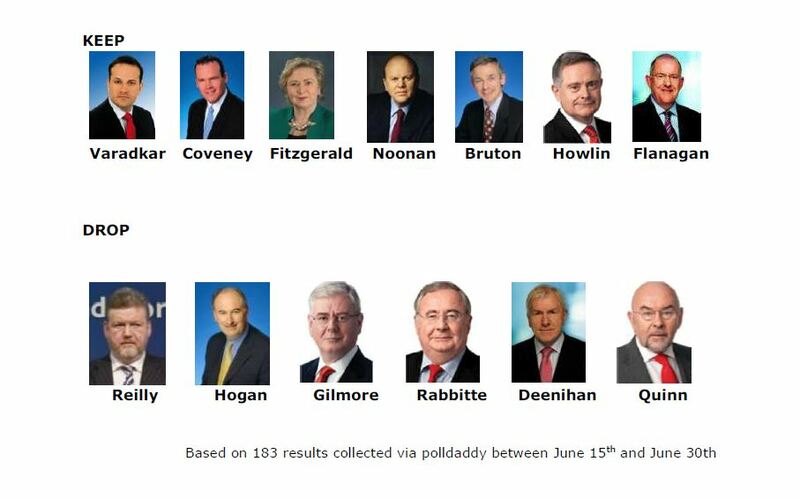 Taking the lower end of this spectrum, this suggests approx 350 posters per TD in each constituency. At an approx min cost of €6 per poster (based on the best price you will get for screen printing in bulk) to cover the price of the corriboard and printing this gives you a total cost of €348,600 BEFORE you factor in the costs of the plastic cable ties and labour costs, by all accounts most of the posters were put up by paid workers. This leaves you with very little change from €600,000 for postering alone – never mind the countless professionally delivered leaflets. Here are the results of the survey I have been running via Polldaddy over the past two weeks. 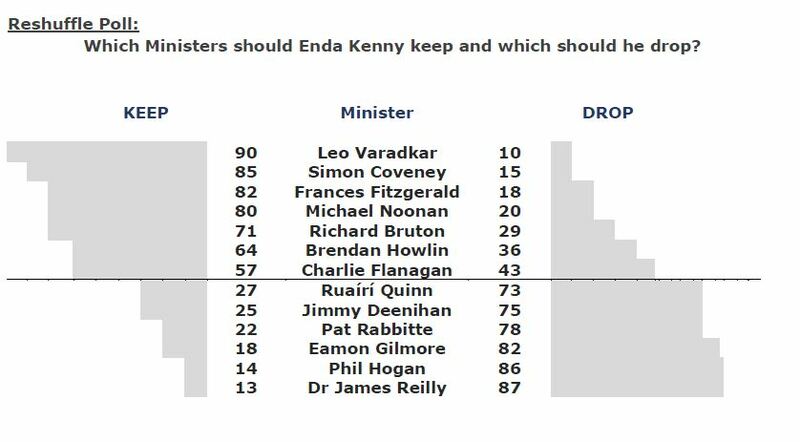 The question was straightforward: which Ministers should An Taoiseach, Enda Kenny drop and which Ministers should he keep.